We launched our first ever crowdfunder today to help us fund the #BeyondBHP week of action. We would really appreciate any donations, big or small, and if you can’t donate, please share instead. Communities all over the world are rising against mining: from La Guajira villagers saying ‘enough’ to BHP’s coal mining project in Colombia, to Marikana’s long struggle for reparations from Lonmin platinum mining company for the killings of mine workers in South Africa. We are inviting front-line activists to the UK in October to share their experiences of resisting exploitation and gaining autonomy over their land and water. Wednesday 17 October 2018 is the day that the world’s largest multinational mining corporation, BHP, will hold their annual general meeting for their shareholders in London. Every year since 2009, London Mining Network has invited environmental human rights defenders from communities that the Anglo-Australian company has wreaked havoc in, to the UK as part of a speaker tour, set up around the AGM. We have secured some funding from Lush Charity Pot and are working with Coal Action Network, Colombia Solidarity Campaign, The Gaia Foundation, War on Want and other organisations to pay for flights, accommodation, food expenses and in-country travel costs for four people from Latin America to take part in the week of action but we are hoping to raise £3,000 to help cover our expenses. 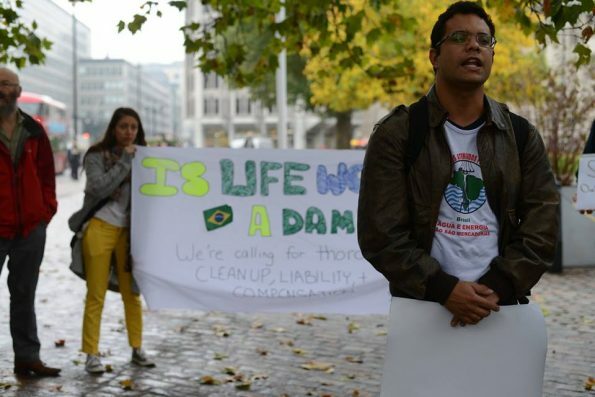 This year we have invited four defenders to participate in the tour called Beyond BHP: breaking free from the world’s biggest mining giant – a member of grassroots network Movement of People affected by Dams (MAB) from Brazil, an organisation that works with people affected by 2015’s catastrophic Samarco tailings (mining waste) dam collapse in Minas Gerais, two from Colombia (an indigeneous activist from La Guajira in the north of the country and one from lawyers’ collective CAJAR, based in the capital, Bogota) and a member of Latin American Observatory of Environmental Conflicts (OLCA), from Chile. BHP is listed on the London Stock Exchange and has many shareholders, some of whom care about its reputation. The defenders will intervene in the AGM to confront shareholders and directors with the promises the company has made that have not yet been fulfilled. They will meet with politicians, mainstream and alternative media, activist groups, NGOs, lawyers and members of the public to share their stories of what is at stake for their communities, how they are resisting and the alternatives they are leading. They will also meet with anti-fracking activists in Manchester and anti-opencast coal mining activists in County Durham. Each year London Mining Network spends a large amount of our annual budget on hosting defenders for the tour but, as a tiny organisation that only requests and accept funding from a small number of organisations whose ethos fits with our own, we are struggling to find the money this year. As in previous years, the buzz around the week of action will increase pressure on BHP to improve its behaviour. Our friends in frontline communities have told us that these visits have played a key role in forcing companies to be more accountable for their activities. Defenders tell us their communities feel supported as a result of these visits. They also say that meeting with others resisting mining in Latin America as well as in the UK unites struggles and builds global solidarity. If you’re in London, participate in the demonstration outside the AGM or another event and listen to the experiences of the defenders. If you can’t be there in person, we will share stories, photos and videos widely on our website, social media and through traditional media. We believe that frontline communities coming to the world’s financial hub to put pressure on London-listed companies is good for all of us. Many of us have historically benefited from extractivism at the expense of the people that have been forcibly evicted from their land or had their health and livelihoods impacted. Supporting our visitors to make their trip to the UK is a step towards a future where communities have greater autonomy over their lands, waters and livelihoods. To get updates about October’s week of action and mining-activism related news, you can sign up to our monthly newsletters and follow us @londonmining on twitter (add your own tweets using #BeyondBHP) and on facebook. Find out more about our work and our governance and for any questions, email: contact@londonminingnetwork.org. You can also support us regularly.